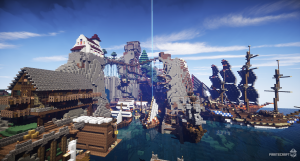 The Cove is the Server Capital Of PirateCraft, you can find server shops, spawnable ships & tutorials at The Cove. This is a PVP free area, along with spawn, north, east, south, and west, and is located at x:-1260 z:345. How do I get to The Cove? Travel from /spawn you can follow the Aqueduct that will have an automated barge to take people to The Cove. Follow the paths north out of spawn and follow the signs to The Cove. Use the train station north out of spawn, follow the paths until you reach the Giant tree, the train station is inside this. 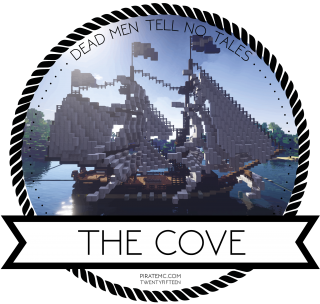 We have an ever expanding range of server facilities at The Cove to take advantage of, this area is also PVP free so its fit for trading. Have a vote key? Use it here! Here you can buy item kits to build your own ships. Buy cannon kits to build your own cannons. You can also activate an XP boost here. Buy ye grog here! The Rusty Keg also teaches you how to create a brewery and brew your own grog. Find out about the different rank kits, if you're too lazy to read the wiki page about it. In the Town center you can repair enhanced custom items for a price, its also the home of the Deed Office, which doubles as GodsDeads office. The Town center hosts The Cove builders storage rooms and Cove Shop storage rooms. There are 2 more floors, one that sells shulker boxes and one that will soon host a small armoury. Be aware of the witch, if she's in a good mood you may be able to trade with her. Earn some money by selling Logs to The Cove wood shop, all materials are used to build more of The Cove. Like to gamble? Try your hand at the diamond jackpot machine! Want a pre-made ship fast? 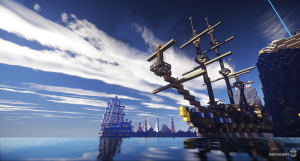 Follow the big docks at The Cove to reach the docks to spawn a pre-made ship, or use /warp ships to get here fast! Repent one's wrongdoing at the Chapel, If you're luck you may spot Bishop Harry_mason2. Coughing_Dogs shop is permanently closed, It stands as a memorial to Coughing_Dogs time on PirateCraft. There are hidden areas at The Cove to try and find!